This was made using the incalmo technique, where two separate bubbles are blown and then they are fused together while they are still molten. Incalmo in and of itself is a very complex technique, but that's just the beginning. After blowing the vase it was then flattened with paddles and sandblasted with silica carbide. 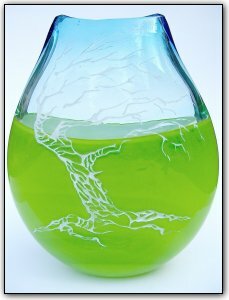 Then after the glass has cooled it is intricately etched to reveal the image of the tree. Make sure to zoom in to see the detail, its absolutely stunning!